Last week’s ‘April Biofools‘ demonstration opposite Downing St looked a promising event to photograph, but I ended up finding it rather disappointing. At least one photographer wisely decided not to hang around and went home after taking just a few pictures. The issue is of course a serious one. Using biofuels looked green enough to attract the support of the EU – and so we got the Renewable Transport Fuel Obligation (RTFO) – and it’s ratification was the reason for this demonstration. Biofuels were seen as a technical fix for carbon emissions, but unfortunately turn out in practice to be the kind of fix that creates more problems (and more carbon dioxide) than it solves. Commercial biofuel production means taking land out of food production, burning down forests and more. 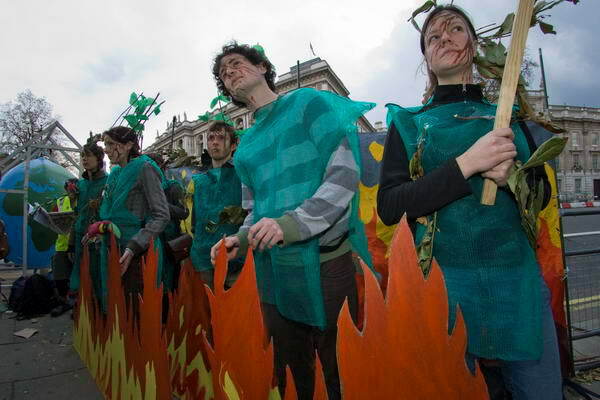 The organisers had gone to some trouble to show some of this in visual terms, with protesters from West Papua, one of the largest areas of rain forest under threat from biofuels, and others dressed up as trees being destroyed by some brightly painted flames. 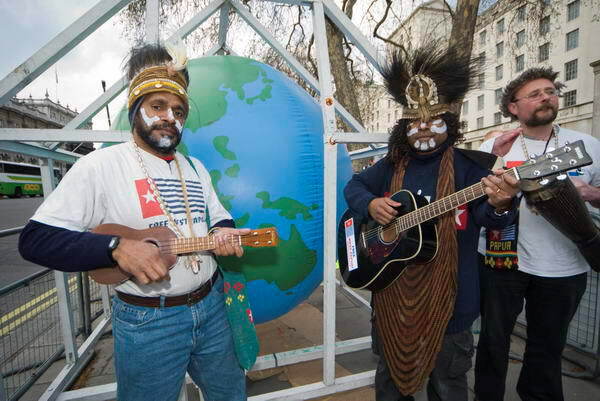 I wasn’t sure where West Papua was, and I was able to get those campaigning for its independence from Indonesia – who invaded it three months after it became independent from Dutch rule – to show me exactly where it was. For once I really made the earth move, turning the globe around to photograph them in front of their country on it. Still not much of a picture though! This entry was posted on Thursday, April 24th, 2008 at 11:16 am and is filed under My Own Work, Photo Issues, Political Issues. You can follow any responses to this entry through the RSS 2.0 feed. You can leave a response, or trackback from your own site.